YoP – week of 7th September. Red Dress – part 4. I have been lazy when it comes to blogging this last couple of weeks. But I have been working hard on my dress. I have completed the section connecting two rounds of flower elements – and I think it looks great! Having tried it on several times, I have changed my plans on how many elements should be in various rounds so that dress would fit my body – for example, I originally planned that this section will be on hips, but it’s too big, as I can see now, so I think it’ll be at the very bottom – unless I take it apart and narrow it. 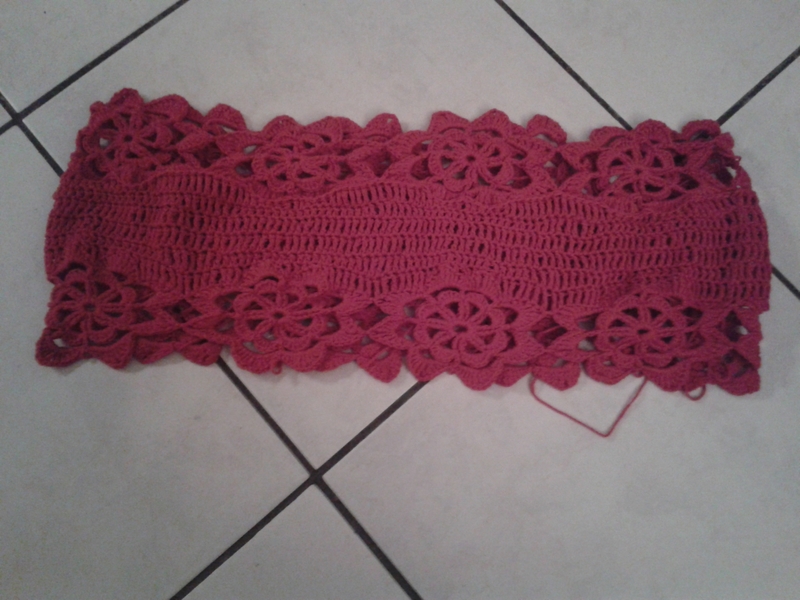 I am now working on the part that will be placed around my chest – hopefully to then connect it to the first yoke round. I then will be able to work my way down and try the dress on as I go. This post is part of a Year of Projects blog-along. You can visit our Ravelry group if you would like to know more. To see all posts related to this meme, click here. My goal for now is to recreate this dress pictured below. I am using 100% cotton – Cotton Soft Speciale Baby by Lane Mondial (180m/50g). It’s not as shimmery as the yarn in the picture, so the overall effect will be slightly different. I am using US crochet terminology throughout. I am blogging in quite a detail to document for me and for anyone else who is interested the whole process. Click on tag “Red Dress” to see all related posts. Separator image Posted in My kniting & crochet and tagged with crochet, crochet dress, Red Dress, YOP. YOP – week of 24th August; Red dress – part 3. Wow you’ve really been making progress, it’s looking good. Very pretty so far! Seems a very good idea to assemble a section, decide where it fits best and then determine your mods for the next section! I’m so impressed by you for attempting this! It will look absolutely AMAZING once you’re done! Really good progress this week. I’m so enjoying how this is coming together.